You've found the “U.S. German Pekin Duck Breeders” page here at Hobby Farm Wisdom! If this is the first time you have visited our site: Welcome! The German Pekin Duck is one among the most affectionate and outgoing of all domestic ducks. 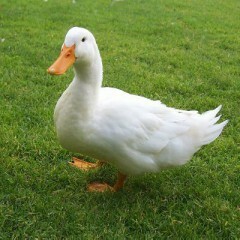 In the United States, duck breeders call this duck Donald Duck. They are native to China and then spread all over the world and are now one of the most powerful breeds in the market for meat. The males weigh about 9 lbs and the females 8 lbs, they have white/cream color feathers and bright orange bill and legs. They have a nearly upward stance and soft feathering. German Pekin ducks are generally found in places where there is water, such as ponds, rivers, lakes and occasionally even on your back yard pool. They are strong, fertile and among the biggest size ducks. They are welcoming serene ducks, but they are one of the noisiest duck breeds to maintain.